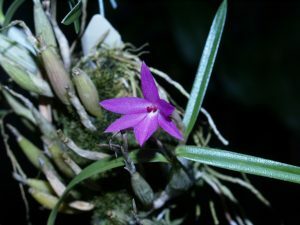 One of the smallest members of the Cattleya family is Sopronitella violacea (or Isabellia violacea) from the Mata Atlantica forests of Eastern Brazil. This species has small flowers and smaller growths than Cattleya coccinea (day 20) but is a good partner for it with a similar liking for growing cool (Cool Americas, minimum 12C). We find that this species needs good drainage and really prefers to be mounted so that it can dry out between waterings. With us the plant is quite slow to make a large plant but is very long lived and reliably produces its lovely pink flowers every February.